Balanced LINAK triple motor frame for extra strength/stability. Includes Smart Desk Controller with automatic drive, 4 presets, and the ability to pair with your iOS or Android smartphone. Desktop surface not included with the DIY Frame Only kit. The UPDESK Pro Frame featuring LINAK technology and manufactured in the United States is made with compact, 3-part electric lifting columns. It is specifically designed for use in commercial applications, and UPDESK has brought it to the consumer market. The 3-piece construction of the Pro frame ensures smooth and precise electric lifting ability no matter how much desktop gear you have (rated for over 375+ lbs) or how tall you may be (accommodates over 98% of the general population). The UPDESK Pro Frame moves synchronously with triple motors (one for each leg) for added strength and stability along with a compact motor housing, which is almost invisible to the user. 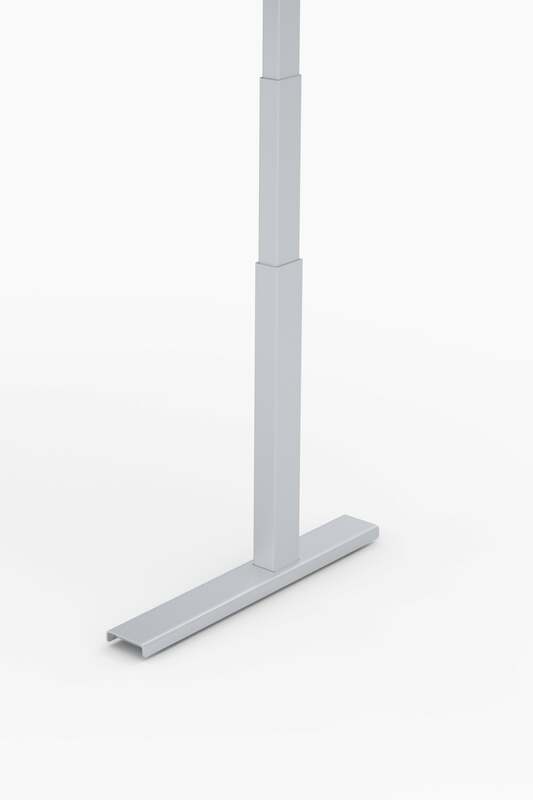 The lifting columns are sturdy enough that a crossbar is not needed on any electric lift UPDESK standing desk. The UPDESK Pro Frame is available in black, white, and titanium to fit into a wide range of desk designs and aesthetics. The Smart Desk Controller is the most advanced standing desk controller available on the market. It features automatic drive (meaning you don’t have to press and hold the preset buttons to reach your predetermined height), Bluetooth technology, 4 memory positions, a digital display featuring the UPDESK logo, and a light strip reminder for you to alternate between sitting and standing. Watch this video to see how quick and easy it is to set memory presets. The desk controller is activated by tilting it in the same direction as the desk is intended to drive, which makes it extremely intuitive. It features a glossy surface with an integrated display for a clean, minimalistic design that is modern and unobtrusive. The display provides guidance to you when operating the desk and desk controller. The LED halo light strip along the bottom of the display reminds you to change positions with a pulsating green and orange light. By downloading the "LINAK Desk Control App" and using the integrated Bluetooth technology, you’ll also be reminded via notifications on your Mac or Windows desktop and iOS or Android smartphone. This electric lift UPDESK model ships in two parcels containing the desktop and pre-mounted bracketing, frame, adjustable legs, and hardware. UPDESK offers volume and bulk-order pricing to provide a solution to enterprise customers around the world. Request a custom quote today for more information. UPDESK sells a line of accessories for your stand up desk that do not require any drilling, but still allow you the same seamless look that you love from the UPDESK Pro Adjustable Standing Desk. Need installation services for your new UPDESK? Contact us prior to placing your order, and we will be more than happy to assist in finding an installer in your area anywhere in the US or Canada. During my search for a quality adjustable height desk, I came across Updesk. I asked questions and got answers quickly. Kamron was eager to help me figure out what I needed and he couldn't have been more helpful. I was able to assemble the desk pretty quickly once my custom surface was fabricated. The instructions could have been a little more clear, but I think that if you're doing a custom top for the frame, you should know what you're getting into. The frame itself is very sturdy. It's very pleasing to the eye (which is something I find important) and the controls are easy to use. This is my first variable height desk and I'm sold. There's nothing like being able to have a choice of standing or sitting to work efficiently. Thanks Updesk! Hardware I was looking for a way to convert my existing corner desk to a sitting/standing desk and found the Ultra Corner Frame. Having never seen the frame in person, I was concerned that it would not meet my expectations considering the price. My concern was unfounded. The engineering and manufacture of the frame is top notch. The legs are industrial strength and their operation is smooth and quiet. The finish is attractive and durable. The controls are easy to use and include three save positions so that it's easy to go from sitting to standing. Overall the frame has exceeded my expectations. Support My desktop is larger than the Ultra SquaredUp and I had questions about where the legs should be mounted. The support received was outstanding. My questions were answered quickly and in detail, including diagrams and a personal contact number for additional questions. Once the mounting locations were determined the installation was straightforward. The completed desk is very solid with no wobble even at full height. I am thoroughly satisfied with my purchase.